You can’t blame Glenn Howard for thinking it might never happen again. The Coldwater skip who has won seven straight Ontario curling titles while rarely suffering a defeat, went into Sunday night’s Tim Hortons Brier final with a dubious record of having won only one national final in the last five tries. To boot, he was facing Alberta’s Kevin Koe, his conqueror two years ago in the Brier’s last showdown between the two. But there was something about the Ontario team at this particular Brier at the Credit Union Centre. It always looked like a winner. And the skip allowed as how it always felt like a winner, too. “Son of a gun!” the 49-year-old Howard yelped following his 7-6 victory over Alberta’s Koe before 9,974 fans. “I told you we’d bring our A-game and there it is! Still I had to make the last shot, Koe kept hanging on, but, oh, it’s a great feeling. It’s a little monkey off our back, I think, but we didn’t miss anything, we brought it tonight. Middaugh, in fact, shot 98 per cent to his skip’s 95. The Ontario team — second Brent Laing and lead Craig Savill — outshot Alberta’s crew 92-80. It was Howard’s 34th win in his team’s last 35 outings on curling’s ice sheets. Right from the get-go and through a 12-game gauntlet during which the team required five extra ends to stay in command of the tournament, Howard rarely wavered. A miscue from Alberta third Pat Simmons in the first end set up Ontario with a deuce and the eventual champs never looked back. “We got an uncharacteristic miss out of Pat, we got our deuce and then kept it tight,” said Howard. Ontario scored deuces in the fourth and sixth ends and kept Koe to difficult singles with draws to the four-foot until the ninth. In truth, the match wasn’t as close as the final score indicated. “We’ve given up two in other games and come back and won,” said the vanquished yet relentless Alberta skip who forced Howard to the last brick. Koe directed Simmons, Carter Rycroft and Nolan Thiessen. 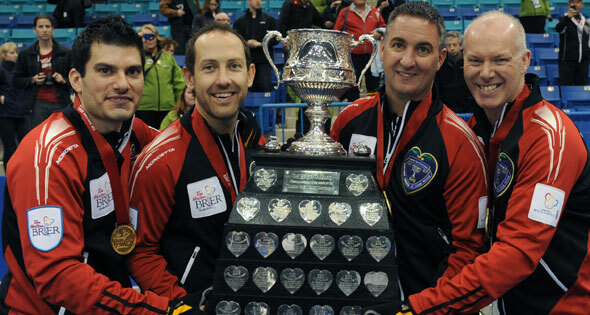 Ontario won its second Brier title in the seven years since Howard has been carrying the torch. He now has an opportunity to repeat his 2007 world triumph scored at Edmonton. This time, Howard’s team will travel to the St. Jacob’s Arena in Basel, Switzerland, March 31-April 8 to defend the title won last year by Winnipeg’s Jeff Stoughton in Regina. “We’re going to give it a good run at Basel,” said Howard. “We’re on a pretty good run now and I hope we can bring that into play in Switzerland. 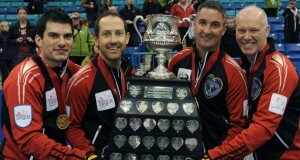 Middaugh won his third Brier title while Laing and Savill each celebrated their second triumphs. “Hey, this team was pretty good before I came along,” said Middaugh. 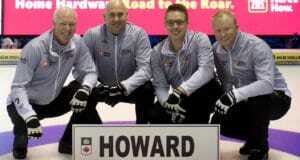 Howard’s only conqueror at this Brier was the surprising Territories team skipped by Kevin Koe’s brother Jamie. That 10-6 setback setback transpired last Sunday night during the Brier’s fifth draw. Five of the last eight Brier finals have been decided by one point. Howard’s 2007 win resulted from a 10-6 final-game conquest of Newfoundland’s Brad Gushue. The win guaranteed $144,000 in Sport Canada funding over a two-year period, $40,000 in TV cresting exposure, $40,000 from Own The Podium for training and competition expenses, and entries to the 2012 Capital One Canada Cup at Moose Jaw, Nov. 28-Dec. 2 and the World Financial Group Continental Cup at Penticton, B.C., Jan. 10-13. Final Brier attendance was 177,226. 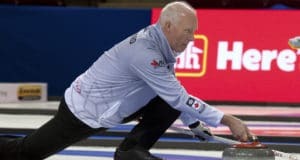 The Hec Gervais playoff MVP award was presented to Middaugh while the Brier’s TSN shot-of-the-week went to Glenn Howard for a raise takeout against Northern Ontario earlier in the week. The Koe team won $40,000 for a second-place cresting exposure value. In addition, each of the 12 Brier teams received $6,150 for wearing the Tim Hortons crest while fifth-through-12th-place teams each received $7,000 from the Athlete’s Assistance Fund.